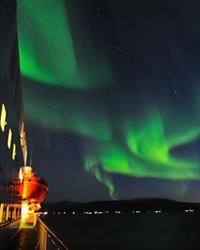 Hurtigruten offers small and intimate ships travelling to the smaller, lesser known areas and ports of Norway, Greenland, Europe and Antarctica. 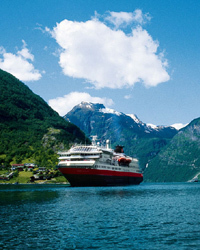 The Hurtigruten fleet consist of 3-4* ships popular with 50+ clients looking to explore somewhere a little different. On board in the relaxed environment, food is of a high standard, freshly prepared and menus are chosen depending on the location. Breakfast and lunch are open seating, however dinner is set seating. Tour leaders are available on board to help you with shore excursions to enable you to make the most of the destinations you are visiting. The atmosphere on board is a relaxed environment and clients on board are those wishing to experience the sights. Musical entertainment is available in the bar on some sections of the voyage but there is no organised programme. Lectures are available on board the Explorer voyages. Currency on board is Norwegian Kroner and tipping is discretionary.